White Keys with bold black lettering. 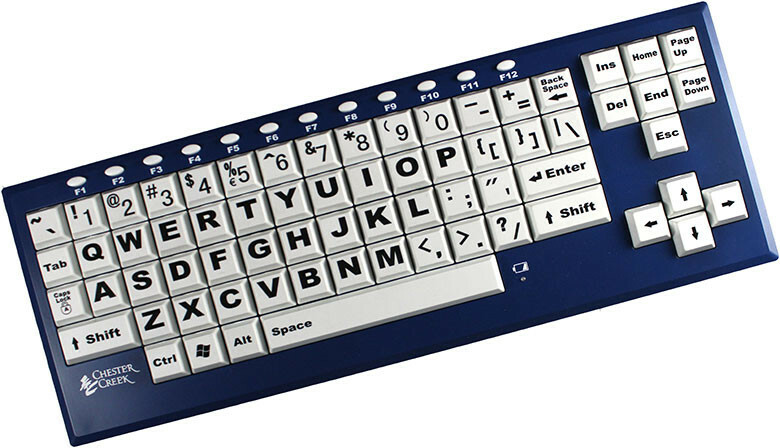 Large 1” keys offer an advantage to people who find it painful or difficult to use a traditional keyboard. White keys with black lettering makes it easy to see. Large font is nearly 250% larger than on standard keyboards. Helps improve readability and reduce eyestrain. Convenient and portable, the wireless BigBlu VisionBoard offers more flexibility and mobility, helps reduce the amount of clutter on a desktop, and has the same functionality as Chester Creek’s wired large-key keyboards such as the VisionBoard. The Bluetooth BigBlu VisionBoard uses wireless Bluetooth technology so you can use it with your Bluetooth enabled devices.